Archives : PULL-BACK OVER, DOWNWARD MOVE RESUMES - 10/07/2015. PULL-BACK OVER; DOWNWARD MOVE RESUMES - 10/07/2015. Finally the global cues caught up with the Indian market; and as a result the market moved lower. The indices closed below the critical long term average of 200dma after making a lower top at Sensex 28335 and Nifty 8561. This indicates that the pull-back is now complete and the downtrend has resumed. In the near term, Sensex 28031-28084 and Nifty 8457-8483 will act as strong resistance. Downward momentum will increase once Nifty closes below the support zone of 8195-8186. Sensex opened the week at 27857, made a high of 28335, low of 27530 and closed the week at 27661. Thus it closed the week with a loss of 431 points. At the same time the Nifty opened the week at 8386, made a high of 8561, low of 8315 and closed the week at 8360. Thus the Nifty closed the week with a loss of 124 points. On the daily charts, both the indices made a Bearish Spinning Top formation on Tuesday and gave a confirmation on Wednesday by forming a bearish candle. Friday saw a small black body candle being formed with long lower shadow. On the weekly charts, both the indices have formed Bearish Harami pattern which requires a confirmation in the form of a black body candle as the next week’s candle. Thus daily as well as weekly candlestick patterns suggest bearishness in the near term. The market was witnessing a pull-back of the fall from Sensex 30024 to 26307 and Nifty 9119 to 7940. The pull-back seems to be completed at the level of 28335 for the Sensex and 8561 for the Nifty and the prior downward move has resumed. This week both the indices made a Bearish Downward Falling Gap between Sensex 28031-28084 and Nifty 8457-8483. This Gap will act as strong resistance going forward. Support zone exists between Sensex 27209-27175 and Nifty 8195-8186 which is a result of confluence between the Bullish Upward Gap between Sensex 27202-27175 and Nifty 8195-8186 and an intermittent low made by Sensex 27209 and Nifty 8195. 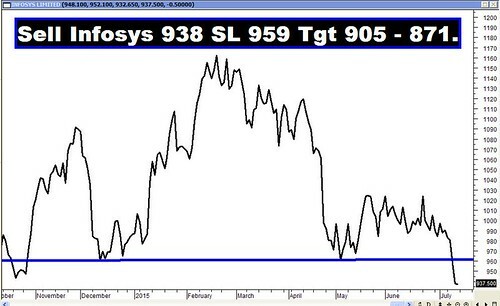 A breach of this support zone will not only intensify the bearish momentum but also pave the way for testing of the recent lows made at Sensex 26307 and Nifty 7940. This week, both the indices tested the long term average of 200dma (Sensex – 27814 and Nifty – 8385) and even the short term average of 20dma (Sensex – 27614 and Nifty – 8329). Even though both the indices managed to stay above the short term average, they could not sustain above the long term average of 200dma. Both Sensex and Nifty continue to remain above the medium term average of 50dma (Sensex – 27378 and Nifty – 8275). Thus the trend in the long term timeframe has turned bearish, but that in the short and medium term timeframe still remains up. Bearish pattern formations still remain intact and hence one can still expect indices to achieve the target of Bearish Rising Wedge pattern which falls at 26049 for the Sensex and 7882 for the Nifty, as well as Ascending Broadening pattern and the target for that pattern is at Sensex 25034 and Nifty 7533. Coupled with this, both the indices had also completed a Head and Shoulders pattern and the target as per this pattern is at Sensex 24486 and Nifty 7425. MACD and Price ROC have given fresh Sell signals. RSI (51) continues to remain just near the equilibrium line. Stochastic Oscillator %K (42) continues to remain below %D, thereby continuing in Sell mode. MFI (70) still indicates positive money flow. OBV is giving a non-confirmation. ADX has decreased further to 15, suggesting that the trend is weak. Directional Indicators has given a Sell signal as +DI has gone below –DI. Thus majority of Oscillators are suggesting a bearish bias in the near term. Options data for July series indicates highest Call Open Interest buildup at the strike of 8400 and highest Put build-up is at the strike of 7900. Thus Option data suggests a trading range with resistance coming in at 8400 and support around 7900.